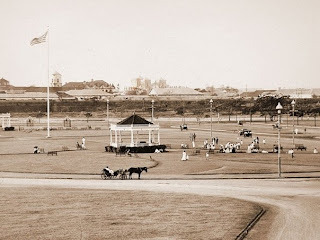 Potous found the Luneta Nueva or New Luneta one of the most "delicious" natural places in Manila because the hand of man had done little to embellish it, i.e. the lily wasn't gilded. 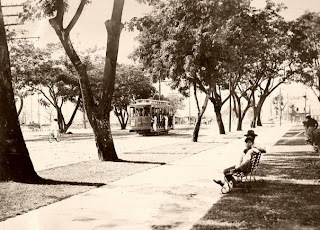 Oddly enough the custom of taking the air at the Luneta from the Spanish times was continued but this time instead of carriages there was an interminable line of cars at the border of the "paseo" with distinguished ladies, respectable gentlemen and beautiful girls inside them. Nobody though got down to walk around or greet each other. Potous was struck by the Filipinas' habit of wearing their hair long and hanging down their backs without any hairpins. 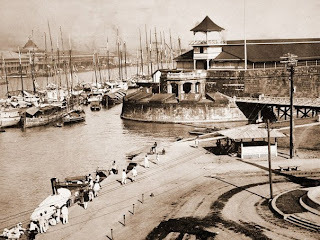 He was also impressed by the elegance of the inhabitants of Manila. Everyone appeared to be in white or ecru perhaps since he describes their shirts as a species of transparent gauze (piña? ), richly decorated. Women wore long skirts with a train pinned to one side prompting him to wonder of what use it had since it was never let loose. The materials favored were brightly colored, the women's arms and shoulders for the most part bare. To cover the low neck line, especially in the street, a large shoulder piece "de quita y pon" (literally, take out and put), usually white and decorated with large flowers was draped on. Their feet and legs were bare of stockings and as a rule no one went unshod but wore slippers of red velvet. The Spanish colony in the islands conceived of constructing a building that would be called Casa de España to house its consulate, the Casino Español and its Chamber of Commerce. 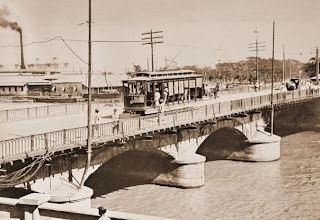 Thus an extensive property was bought in what then was considered the best place in Manila. The project owed its success no less to a contractor called Farre (Luneta Hotel), el Conde de Peracamps a.k.a. Antonio Melian (El Hogar) and Gen. Las Heras. In the center of the building extended a hall of "colossal" proportions called the Salon de Actos (Arcos?). From its ceiling hang huge chandeliers and the floors were of hardwood donated by Doña Trinidad Ayala de Zobel. From the sides radiated reception rooms, dressing rooms, a general dining hall and a lecture room where free Spanish lessons were taught. Enormous Japanese and Chinese jars as well as other pieces of porcelain decorated the salons. There was a beautiful terrace leading to the tennis courts and the fronton of pelota as well as a more informal dining area. Facing the terrace as well was the library, and a barbershop. Potous had the pleasure upon his arrival of attending a night time fiesta celebrated in the church of San Pedro de Malate to solemnize the feast of Our Lady of Remedies. The church was full of parishioners and the candles in front of the virgin's image looked as though they could total hundreds. There were more than six persons taking care of installing the candles and keeping them lighted. Although the interior of the church appeared to glitter in gold, the fair celebrated in the plaza of Malate and the streets around were more interesting to him because they reminded him of the fiestas of Spain by the number of stalls where food and other articles were for sale. A seemingly disorderly multitude of natives, mestizos (half-breeds), and foreigners circulated through the aisles between the stalls. Among the things for sale were sweets that seemed to form pyramids in the stall counters. The most extraordinary were the names completely unknown to the author of course: Madoya, dinuguan con poto, goto, ukoy, palitaw, buche, bico, bichobicho and pilipit. Fruits such as sincamas, lanzones, santol, lomboy, casuy, apulid, sungay kalabao, camachile, cabezas de negritos and balatong were sold. Old timers assured him that the "verbenas" had lost their vitality and gaiety since Spanish sovereignty had ceased over the archipelago. But this wasn't apparent to Potous who saw in this fiesta in Malate the vestiges of that old Spanish culture. Even as an Australian I have enjoyed these pictures. They are very different from even my first visit to Manila in 1979. Do you have any nore pictures of old buildings, both town and rural ones? If so, would you please be able to email me at glynn@fernvalescenics.com thanks.